The communities of Electoral Area B are varied and distinct, but all share in the natural beauty and rural character of the region. Found within the traditional territory of the St’át’imc Nation, large hunter-gatherer winter villages historically existed along the region’s many lakes and rivers. Rich salmon stocks supported the aboriginal economy. Settlers of European descent first came to the area in the early 1800s, and by the mid-1850s the fertile river bottoms and benches were being extensively farmed. Agriculture is still an important economic driver in Electoral Area B, along with resource based industries like forestry, as well as manufacturing, construction, health services, education, and tourism. Area B shares a close and mutually supportive relationship with the District of Lillooet, which is the commercial hub of the area. Electoral Area B is the northeastern-most area in the Squamish-Lillooet Regional District. 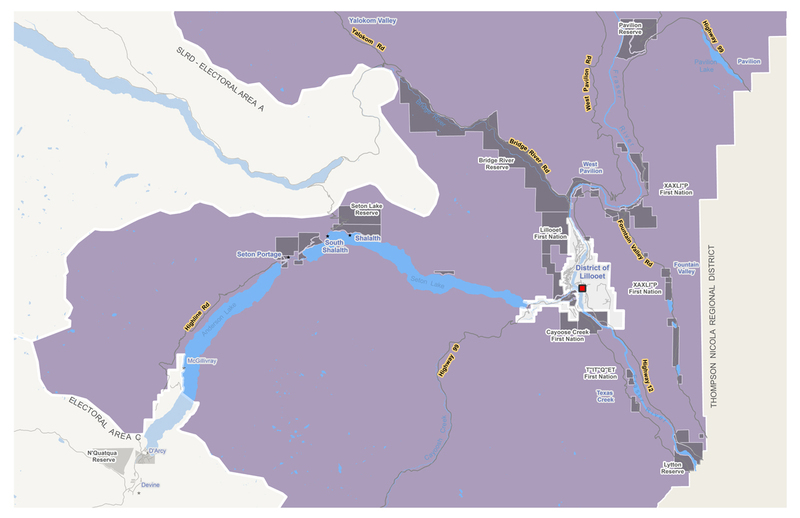 It is bounded by Electoral Area A and Electoral Area C to the west, the Thompson-Nicola Regional District (TNRD) to the east, the Cariboo Regional District and the TNRD to the north, and Area C and the TNRD to the south.